Kirkwood offers backcountry adventurers the opportunity to ski/ride Kirkwood’s best areas including out-of-bounds. Expedition Tours include guided rides, starting at $200, and private guide rides starting at $195 for 2 hours. 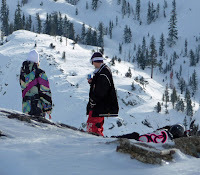 Kirkwood also offers numerous safety courses relating to avalanche safety and trip planning. Curriculum and teaching methods are recognized by the American Institute of Avalanche Research and Education (AIARE). The Backcountry Camp is four days of instruction, taught by professional guides and avalanche instructors. Topics include, snowpack evaluation, terrain identification, rescue procedures, and route planning. Graduates will earn their Level 1 Certificate from AIARE.